Scott Jacobs Hand Signed and Numbered Limited Edition Canvas Giclee: "A Fine Year -110th Anniversary Release"
Edition Size: Artist Hand Signed and Numbered. Limited Edition to 195. COA included. 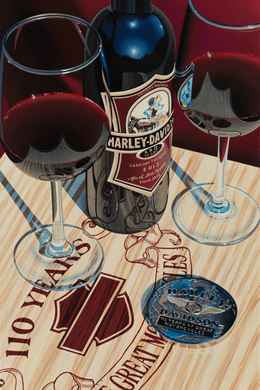 About the Artist: Whether it's a Harley-Davidson® motorcycle, classic car, fine bottle of wine or a delicate dew covered flower, Scott's attention to detail supersedes all expectation. Every detail is perfection, right down to the reflections within reflections. Admirers are often surprised to discover that the image before them is not a photograph, but a Scott Jacobs original painting. Scott's images can be seen on many objects from limited editions graphics to Franklin Mint Collector Plates, coffee mugs, beach towels, clocks and many others. 2010 saw the release of his second book, The Art of Scott Jacobs - The Complete Works.